SEOUL, South Korea: Thousands of South Korean workers took to the streets of the capital Saturday, demanding that a just-concluded free trade agreement between their country and the United States be scrapped. A crowd of protesters sat down in a busy street near a major university in Seoul, shouting slogans against the free trade deal they say will cost South Korean jobs. Police estimated there were 6,000 demonstrators. On Monday, the U.S. and South Korea wrapped up 10 months of often tense negotiations, overcoming differences in key sectors such as automobiles and agriculture to clinch the biggest such deal for Washington since the North American Free Trade Agreement more than a decade ago. It is also the biggest ever free trade agreement for South Korea, the world’s 10th-largest economy and home to global corporations such as Samsung Electronics Co. and Hyundai Motor Co.
"We cannot recognize or acknowledge this unjust deal and so we are calling for its full nullification," said Heo Young-koo, vice president of the Korean Confederation of Trade Unions, which organized the rally. "And we’ll struggle to that effect." 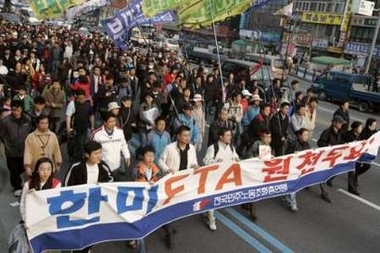 The 800,000-member strong KCTU is one of two major umbrella labor organizations in South Korea and generally considered more militant than the rival Federation of Korean Trade Unions. Heo said his organization planned to conduct an education campaign for workers and farmers over the next two months to raise awareness of the agreement before the two governments sign it. Some of the protesters then marched across town to take part in a candlelight rally. Police estimated the number of marchers at about 4,000, with 2,500 gathering in front of Seoul City Hall. The crowd held candles, listened to speeches and shouted slogans against the agreement and South Korean President Roh Moo-hyun, who strongly backed it. The rally was dedicated to a South Korean taxi driver who set himself on fire last Sunday outside the Seoul hotel where negotiators were trying to conclude the deal. He survived, but suffered third degree burns over much of his body and remains in hospital. Roh and U.S. President George W. Bush are expected to sign the agreement by the end of June, though final approval depends on votes in the U.S. Congress and South Korea’s National Assembly. The deal cuts or eliminates tariffs and other trade barriers in a wide range of sectors including manufacturing, agriculture, finance and medicine. South Korea’s politically sensitive rice market, however, was kept out of the agreement, amid intense lobbying from farmers. Labor, farm, student and social activist groups loudly protested throughout the 10 months the deal was under negotiation. The largest protest came in July, when about 25,000 people rallied in central Seoul amid a monsoon downpour. Some rallies resulted in clashes with riot police. Despite the discontent, a poll taken after the agreement was concluded found that a majority of South Koreans welcomed the deal. A total of 58.5 percent favored it, while 30 percent were opposed, according to the survey, commissioned by the mass circulation Chosun Ilbo, South Korea’s largest newspaper. The poll also found that the completion of the agreement was boosting the political fortunes of the embattled Roh, who fended off strong opposition to it from his former political allies. 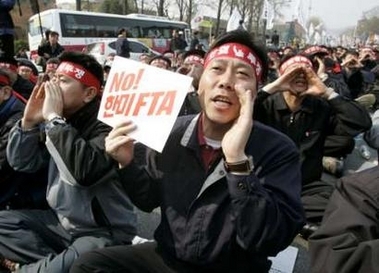 Roh called the trade pact a matter of survival for South Korea. His popularity jumped to 29.8 percent, more than double the 13.4 percent recorded in January, according to the poll conducted Tuesday by Gallup Korea of 708 adults. The margin of error was plus or minus 3.7 percentage points. Roh’s term of office ends early in 2008 following the country’s next presidential election in December. He is barred from seeking re-election.